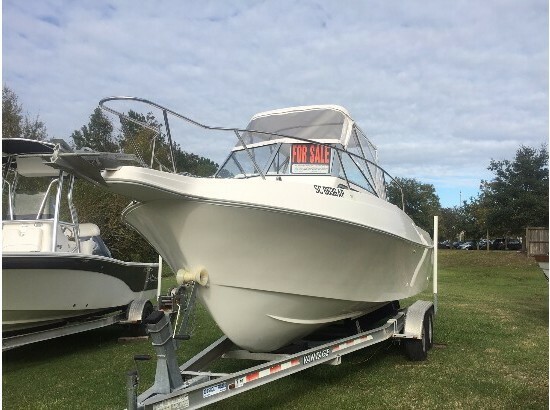 Marine Connection Boat Sales 1-772-222-7850 Vero Beach, FL 2004 Aquasport 250 Explorer Walkaround 2004 Aquasport 250 Explorer Walkaround Cuddy Boat Hard Top 225hp Outboard $24,900 ConditionUsed MakeAquasport Model250 Explorer Powered byEvinrude 225HP 2 Stroke Length26'1" Beam8'6" Hours (Actual) Get Pre-Approved PHOTOS BOAT HIGHLIGHTS Hard Top Trim Tabs Hydraulic Steering Cockpit Enclosure BOAT INFORMATION The Aquasport 250 Explorer is a deep walkaround with extra large, high bow rails - great for choppy seas, big anglers and family security. But farther aft is where the 250 really earns her keep. Constructed all on one level for easy fish-fighting maneuverability, the huge cockpit area is flanked by enormous fish boxes and crowned by cushioned pedestal seats. Down below is a full-size cabin with V-berth and self-contained head. And the full transom provides plenty of deck space for family, friends and all their gear. 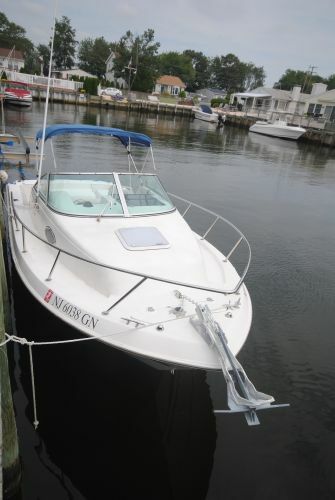 This 2004 Aquasport 250 Explorer boat is in good condition. It is powered by a 225 Evinrude 2 stroke outboard with stainless steel prop. 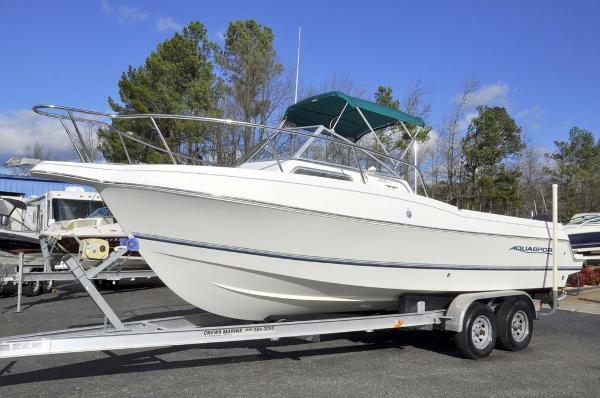 If you are looking for a boat with a large deck space for fishing this Aquasport is it. There is a large transom livewell and in deck fish box with macerator. In the cabin there is a fresh water sink, head with holding tank and cushions. There is a large removable bow cushion for seating while docked. There are rocket launcher rod holders mounted on the hardtop and some gunwhale rod holders as well. Our service department has performed a mechanical evaluation & water tested it and she performed great - the motor has good/even compression on all cylinders. Surveys and mechanical inspections are welcome. Sold as-is, where-is. HISTORY REPORT Know before you buy with a Boat History Report. These comprehensive reports include: Accident check, Salvage check, Environmental Lien check, Seizure check, Hurricane Damage checkand much more... Click below for your FREE Boat History Report! That's right, we have already paid for it! View Boat History Report FEATURES & OPTIONS Deck Options Fiberglass Hard Top Fish box Livewell Walk thru Transom Three Step Stainless Steel Ladder Pedestal Seats Holding Tank Trim Tabs Fresh Water Sink Hydraulic Steering Stainless Steel Prop Cockpit Enclosure SPECIFICATIONS HIN AQABLA52B404 Length 26'1" Beam 8'6" Person Capacity 8 Weight 4,615 lbs. Deadrise 19 Draft 15 Fuel Capacity 141 gal Exterior Top Hard-Top Exterior Color Blue Engine(s) Evinrude 225HP 2 Stroke, 05064033 TRAILER A 2014 EZ Loader Tandem Axle Aluminum trailer is available for purchase for $3,450. A trailer is not included in the price of the boat. FINANCING SHIPPING & DELIVERY United StatesWe offer nationwide delivery to your door! Please contact our Sales Department for an accurate delivery quote. International / Export Australia: We ship to Sydney, Brisbane, Melbourne, Fremantle and all Australian ports. Please our Sales Department for the most accurate shipping rates. Canada: We can deliver to your nearest boarding crossing. Please contact our Sales Department for pricing. Europe: We ship to Bremerhaven, Amsterdam, Gotherburg, Southampton and all European ports. Please contact us for the most accurate shipping rates. We also offer CE Certification! South & Central America: We ship to all major ports, please contact our Sales Department for the most accurate shipping rates. Asia: We ship to all major ports, please contact our Sales Department for the most accurate shipping rates. ABOUT MARINE CONNECTION The Ultimate Boat Shopping Experience. Welcome to Marine Connection - South Florida's #1 Boat Dealer. We are a new boat dealer for Cobia, Hurricane, Pathfinder, Sportsman, Rinker, Bulls Bay and Sweetwater boats along with pre-owned bank repossessions, liquidations, factory distressed short sales, close-outs, trade-ins, and more. We have been selling and exporting boats since 1987 and still hold true to our founding goal of providing the most pleasant and professional boat purchasing experience for thousands of satisfied customers. Marine Connection has been named Boat Dealer of the Year by Boat & Motor Magazine and ranked 6th in Boating Industry Magazine's list of Top 100 Boat Dealers, the most coveted award in marine market. We were also one of the first dealerships in the nation to receive Five Star Marine Industry Dealer Certification. Our NEW Vero Beach store is conveniently located on US Highway 1, just south of 17th Street. This facility is the exclusive new boat dealer for Cobia, Hurricane, Pathfinder, Sportsman, Bulls Bay and Rinker boats on the Treasure Coast! View our other Auctions CONTACT US Located at Marine Connection - Vero Beach 1530 U.S. 1 Vero Beach, FL 32960 Business Hours Monday Closed Tuesday 9:00am - 6:00pm Wednesday 9:00am - 6:00pm Thursday 9:00am - 6:00pm Friday 9:00am - 6:00pm Saturday 9:00am - 6:00pm Sunday 10:00am - 4:00pm Deposit is required within 2 days from end of auction (non refundable) and full payment is required within 7 days. We offer a number of financing options with approved credit. If you are planning to use our financing services, please pre qualify before bidding by calling us at 1-888-693-3470. Boat must be paid in full before delivery. All boats are charged a $240.00 administrative office paperwork fee, for Florida residents we also collect sales tax. Items are listed internationally and we reserve the right to end listings early. Payment methods: Certified Cashier's Check, Wire Transfer, Cash in Person - call for more details. Shipping: Nationwide delivery is available as well as shipping worldwide. 2005 Aquasport 250 Explorer Nice 26 Aqua Sport Walkaround That Appears To Have Been Fresh Water Used! Well Powered By Twin 150 HP Mercury 2 Strokes! Nice Power Package! Impressive Helm With Full Instrumentation, Hydraulic Steering, And Trim Tabs. Nice And Very Open Fishing Cockpit Offering Closed Transom With Integrated Live Well, Fish Box, Non Skid, Transom Door, Wash Down, Bait Prep Station, And More! Offering A Spacious And Nice Cuddy With Sink, Porta Pottty, And V Berth. This Is A Very Versatile Deckplan Perfect For Fishing, But Can Also Be Great Family Cruising With Bow Seating And Bimini Top. There Is No Trailer Included At This Price, But Thee Aluminum Trailer, W/Power Winch, Can Be Purchased Additionally. 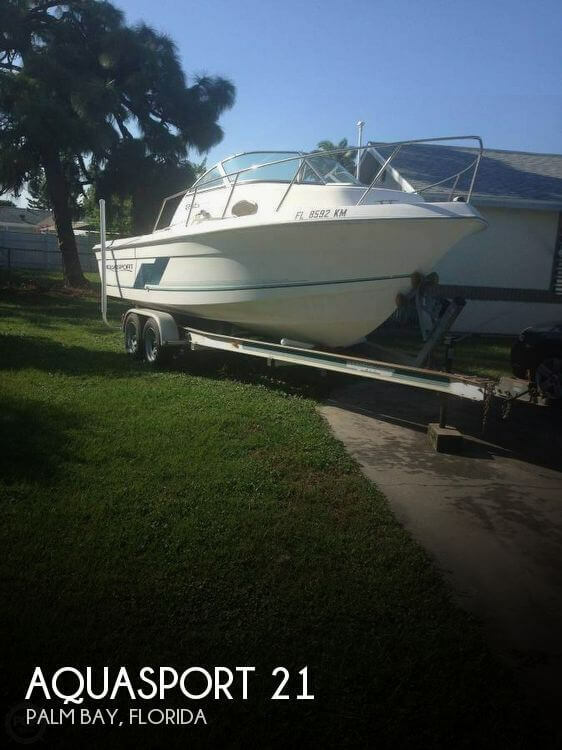 Nice Boat That Is Priced To Sell, But Serious Offers Are Encouraged. Inquire Today! 2000 Aquasport 215 Explorer Forever exciting and quality, this Aquasport 215 is built for fun, fishing, family time and more. 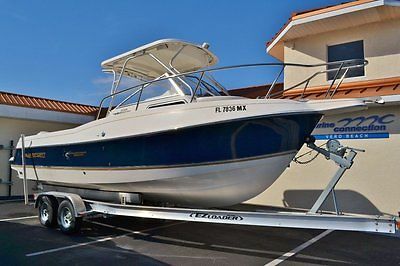 This 215 Walkaround Cuddy offers all you need for fishing and is equipped with livewell, rod holders and storage, ample cockpit space and cabin room for a comfortable and fishable boat that's safe for your day's excursion!